Generics and Biosimilars Initiative Journal (GaBI Journal). 2017;6(1):7-12. Introduction: The US Food and Drug Association (FDA) released its requirements for the non-proprietary naming of biological products in January 2017. Before the FDA’s release, the Alliance for Safe Biologic Medicines (ASBM) asked physicians for their views on the labelling and naming of biosimilar medicines. Study objectives: To determine the opinions of physicians who prescribe biologicals about labelling and naming of biologicals/biosimilars. Methods: 400 prescribers of biologicals in the US were asked what information they would like to see included in a biological product label in order to choose between multiple biosimilars and their reference products. In a separate survey, 400 prescribers were asked how biosimilars should be named. In the labelling survey, prescribers were asked what information should be included in a label, such as what clinical data should be present; whether the product was a biosimilar; and whether or not it was interchangeable. In the naming survey, prescribers were asked for their opinion on product naming in general and on what were then FDA proposals (now FDA requirements) for biosimilar naming. Results: All items queried in the labelling survey were considered very important for label inclusion. The fact that a drug was a biosimilar was considered the most important; whether it was interchangeable was marginally less important. In the naming survey, 66% of respondents thought that FDA should require a distinct non-proprietary scientific name for every FDA-approved biological product – whether originator or biosimilar. 60% thought that a manufacturer-specific suffix should be added to the name. Conclusion: The physicians surveyed generally agree on the issue of the labelling of biosimilars. Two thirds of respondents to the naming survey agreed that FDA should require a distinct non-proprietary scientific name for every biological product they approve – whether originator or biosimilar. However, 53% did not support FDA’s proposal to add a random suffix to the name, and would prefer a suffix that indicated the manufacturer. Biological medicines are therapeutic proteins produced using living cells. A copy of an original biological made by a different manufacturer is referred to as a biosimilar or follow-on biological rather than a generic drug because it will be similar, not identical, to the product it copies. Biosimilars are also referred to as subsequent entry biologics (SEBs) in Canada. As a result of the abbreviated biosimilar approval pathway , biosimilar medicines are now available in the US market. The market uptake of biosimilars in the US will depend on regulatory policies , for which an agreed naming and labelling system will be key. A survey of the views of European physicians on familiarity of biosimilar medicines has demonstrated the need for distinguishable non-proprietary names to be given to all biologicals . There have been calls for clear regulation in this area from Latin America , Malaysia  and beyond. Since FDA has only distributed draft guidance on the naming of biosimilar medicines  at time of the survey, feedback from the physicians who prescribe biologicals may well be helpful in determining how these drugs are to be regulated. The Alliance for Safe Biologic Medicines (ASBM) invited 5,423 physicians in the US to complete a study on the naming of biologicals. A total of 433 physicians responded, of which 400 prescribers of biologicals qualified and completed the study. Prescribers were asked for their feedback on the non-proprietary biologicals naming proposal issued by FDA in August 2015 . FDA has proposed a new policy that would require every biological – whether originator or biosimilar – to have a distinct non-proprietary scientific name. Prescribers concluded that FDA was right to require a distinct non-proprietary scientific name for every biological product – originator or biosimilar – that FDA had approved. Product labelling is seen at the heart of building user confidence in biosimilars . In a subsequent study, the ASBM invited 9,813 prescribers to complete a study on the labelling of biologicals. 624 of these responded, of which 400 qualified and completed the study. Physicians who completed the study were asked what information they would like to see in a biological product label in order to choose between multiple biosimilars and their reference products. Physicians were asked what information could be included in a label, such as what clinical data should be present; whether or not the product was a biosimilar; and whether or not it was interchangeable. All the information included in the labelling survey was considered important by the physicians surveyed. The greatest importance was accorded to an indication that the drug was a biosimilar. Physicians responded that including information on interchangeability was slightly less important than this. Four hundred physicians were recruited in the US to complete a 15-minute web-based questionnaire on biosimilar labelling. In a separate, independent study, 400 prescribers were recruited in the US to complete a 15-minute web-based questionnaire on biosimilar naming. Participants in both surveys received a standard cash stipend of US$25 for their time to complete the survey. All participants in the labelling survey were located in the US. They were recruited from a large, reputable panel of physicians and were all board certified in one of the following six specialities: dermatology, endocrinology, nephrology, neurology, oncology, or rheumatology. All participants prescribed biological medicine. Of the 400 physicians who completed the labelling survey, 23% specialized in dermatology, 15% in endocrinology, 16% in nephrology, 15% in neurology, 16% in oncology, and 16% in rheumatology. Prescribers completing the labelling survey worked in different settings. Twenty-six per cent of respondents worked in a community setting, 24% worked in an academic medical centre, 22% worked in a multi-speciality clinic, 17% worked in a private or family practice, 8% worked in a hospital, see Figure 1. 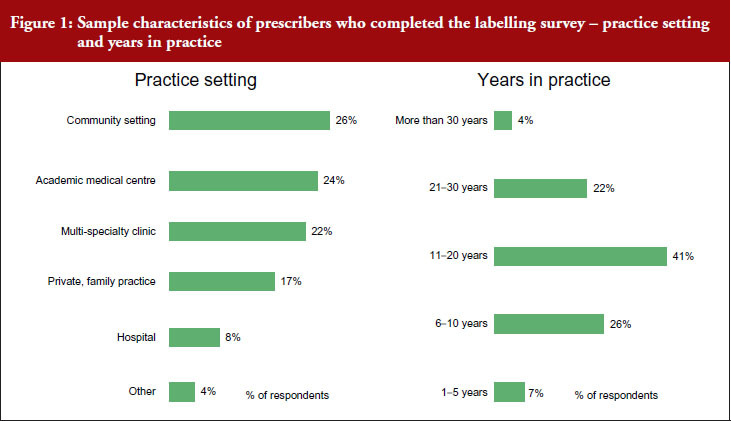 A total of 7% of participants in the labelling survey had spent 1–5 years in practice, 26% had spent 6–10 years, 41% had spent 11–20 years, 22% had spent 21–30 years, and 4% had spent more than 30 years in practice. The 400 participants in the naming survey were also based in the US. They were recruited from a large, global panel of healthcare professionals. Participants specialized in one of the following seven therapeutic specialities: dermatology, endocrinology, gastrointestinal, nephrology, neurology, oncology or rheumatology. Among physicians completing the naming survey, 13% specialized in dermatology, 15% in endocrinology, 14% in gastrointestinal, 14% in nephrology, 14% in neurology, 16% in oncology, and 14% in rheumatology. Prescribers completing the naming survey worked in different settings. 26% of respondents worked in an academic medical centre, 25% in a community setting, 20% in a private or family practice, 18% in a multi-specialist clinic, 7% in a hospital, and 2% in a military/veterans affairs hospital, see Figure 2. 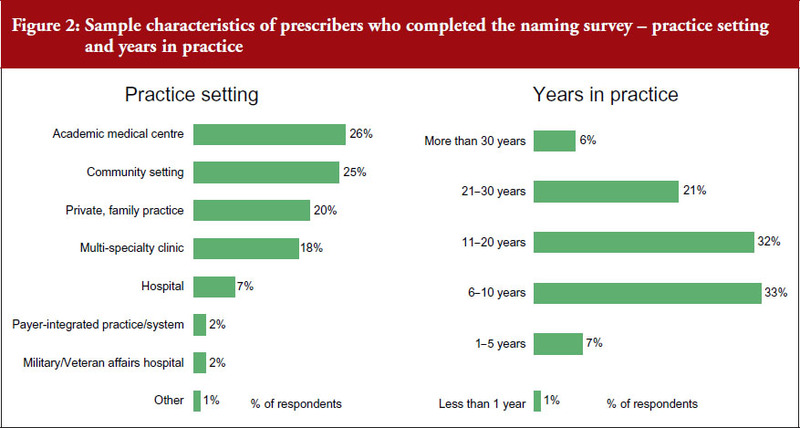 A total of 7% of the physicians completing the naming survey had spent 1–5 years in practice, 33% had spent 6–10 years in practice, 32% had spent 11–20 years, 21% had spent 21–30 years, and 6% had spent more than 30 years in practice. Participants in the naming survey were asked about their familiarity with FDA’s ‘Orange Book’ , the resource for Approved Drug Products with Therapeutic Equivalence Evaluations. The ‘Orange Book’ is a reference that identifies drug products approved on the basis of safety and effectiveness by FDA. Only 13% considered themselves very familiar with the book, 33% somewhat familiar, 26% vaguely familiar, and over a quarter (28%) had never heard of it. Only 4% used the Orange Book on a daily basis, 17% used it weekly, 14% used it monthly, 28% used it rarely, and 37% never used it. Asked about their familiarity with FDA’s ‘Purple Book’ , that is, the resources for Lists of Licensed Biological Products with Reference Product Exclusivity and Biosimilarity or Interchangeability Evaluations, 8% were very familiar, 23% were somewhat familiar, 28% were vaguely familiar, and 41% had never heard of it. Only 4% used the Purple Book daily, 11% used it weekly, 12% used it monthly, 23% used it rarely, and over half (51%) never used it. Information contained in the Purple Book is designed to help enable a user to see whether a particular biological product has been determined by FDA to be biosimilar to or interchangeable with a reference biological product. All physicians questioned in the naming survey claimed that they identified all medicines that they prescribed (biological and chemical) in the medical record. Asked how they identified a medicine in the patient record, 25% said by scientific name, 34% by brand name, and 39% said it varied by medicine. Asked whether they would report an adverse event by using a drug’s product name or National Drug Code (NDC) number, 47% said they would use the brand name, 38% said they would use the scientific name, 2% would use the NDC number, and 13% had no preference. Participants in the naming survey were asked for their attitudes and beliefs on product naming for originator and biosimilar products. 72% of respondents thought that if medicines had the same non-proprietary scientific name then they were probably structurally identical, 16% thought they would not be structurally identical, and 12% had no opinion. If two products have the same non-proprietary scientific name then 68% of respondents thought that a patient could safely receive either product and expect the same result. Twenty-one per cent of respondents would not expect the same result, and 11% had no opinion. Asked about switching (when a patient is switched from one medicine to another), 60% of respondents thought that patients could safely be switched between two medicines that had the same non-proprietary scientific name and expect the same results. A quarter of respondents (25%) thought that patients could not safely be switched between two medicines with the same non-proprietary scientific name, 14% of respondents had no opinion. 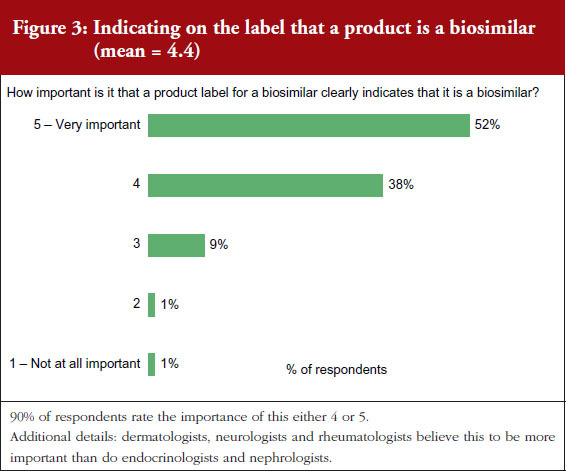 On a scale of 1–5, where 1 is not important at all and 5 is very important, 90% of the physicians questioned rated the importance of whether a product label for a biosimilar should clearly indicate that it is a biosimilar as either a 4 or 5, see Figure 3. 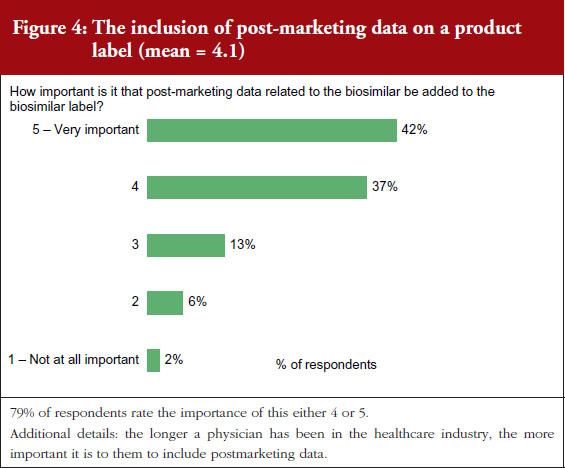 On the question of post-marketing data, 79% of respondents rated the importance of including this data on the biosimilar label as either a 4 or 5, see Figure 4. 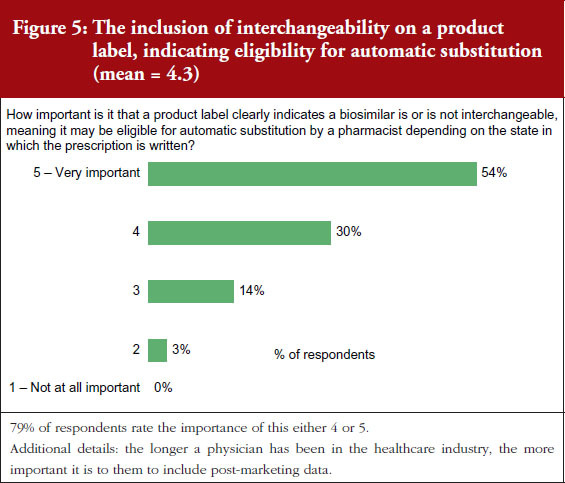 On the question of interchangeability, 79% of respondents rated the importance of including whether or not a biosimilar is interchangeable as either a 4 or 5, see Figure 5. The responses of physicians to questions on biosimilar labelling are shown in Table 1. In the naming survey, prescribers were asked whether FDA should require a distinct non-proprietary scientific name for every biological product FDA had approved – whether originator or biosimilar. FDA has recently proposed a distinct non-proprietary scientific name for all products, whether originator or biosimilar. This is intended to aid the process of pharmacovigilance and accurate prescribing and dispensing of medicines. Respondents were asked for their views on the information that should be included in a product name and for their attitudes and beliefs on substitution. Responses to questions in the physicians’ naming survey are shown in Table 2. The spread of prescribers’ responses to questions related to the information contained in the representative suffix are given in Figure 6. Generally speaking, all issues raised in the labelling survey were considered by the physicians surveyed to be very important for label inclusion. The inclusion of an indication of interchangeability was considered very important by 54% of the physicians. In fact, the physicians concluded that interchangeability was – of all the features included in the survey questions – the least important feature, with an average score of 4.1 out of 5. On average, the physicians gave the highest score, 4.4, to indicating that the drug was a biosimilar. Segment differences were examined for all issues included in the survey. Segments among physicians included specialty, time spent working in health care, and practice setting. Very few specialty differences were noted and no differences for practice setting were noted. In general, the longer a physician had been in practice, the more important they thought it was to include the features mentioned in the survey on the biosimilar product label. FDA proposal for a random suffix on a product’s name that does not indicate the manufacturer was not broadly welcomed, with only 9% of respondents agreeing with FDA. Instead, most physicians (60%) would prefer a suffix on the non-proprietary scientific name that is indicative of the product’s manufacturer. A third of respondents (32%) had no opinion. In the naming survey, it was clear that respondents were not in complete agreement on how biological medicines, whether originators or biosimilars, are named. Reaching an agreement on the naming of these medicines will be key in building user confidence in biosimilars. The data presented here provide important feedback from a wide range of physicians who prescribe biologicals in the US. The findings will be helpful in determining how these biosimilar medicines are regulated in future. The fact that a drug was a biosimilar was considered the most important; whether or not it was interchangeable was slightly less important. In general, the longer a physician has been practising, the more important they considered the inclusion of post-marketing data and a clear distinction between data generated by the biosimilar sponsor and by the originator sponsor. 66% of physicians thought FDA should require a distinct non-proprietary scientific name for every biological product – whether originator or biosimilar – that FDA had approved. 11% of physicians did not, and 23% of physicians had no opinion. 60% of physicians would prefer a suffix on the non-proprietary name that is indicative of the product’s manufacturer. 32% of physicians had no opinion. 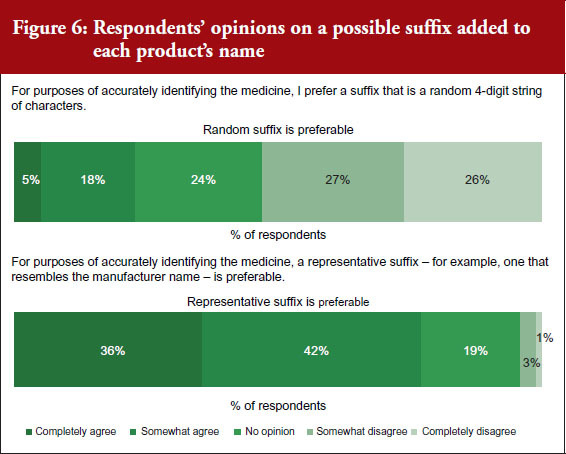 Only 9% of physicians thought a random suffix that does not indicate the manufacturer – as recently required by FDA – would be best. 35% of respondents considered it very important they had the authority to designate a biological medicine as ‘dispense as written’ or ‘do not substitute’. Nearly all respondents considered it important and only 2% of respondents thought it was not at all important. The Alliance for Safe Biologic Medicines (ASBM) is an organization composed of diverse healthcare groups and individuals – from patients to physicians, innovative medical biotechnology companies and others – who are working together to ensure patient safety is at the forefront of the biosimilars policy discussion. The activities of ASBM are funded by its member partners who contribute to ASBM’s activities. Visit www.SafeBiologics.org for more information. Competing interests: Harry L Gewanter, MD, FAAP, FACR, Chairman of the Alliance for Safe Biologic Medicines (ASBM), and Mr Michael S Reilly, Esq, Executive Director; are employed by ASBM. This paper is funded by ASBM. 1. Biologics Price Competition and Innovation Act of 2009, Public Law 111-148, Sec. 7001–7003, 124 Stat. 119. Mar. 23, 2010.